Choutari: How does our effort for promoting professional communication relate to NELTA’s goals and how might we be able to enhance them? Mr. Gautam: First of all, I would like to appreciate the efforts of our young colleagues Shyam, Bal, Prem and Sajan for taking initiative to begin the NELTA Choutari forum which has offered a professional platform for the NELTA members to share their ideas, arguments, views and their observations. This effort is directly related to the NELTA goals. As mentioned in the NELTA constitution, the two key objectives (among five objectives) of NELTA are: (2) To provide a forum for individuals, institutions and associations having similar goals and (3) To foster the exchange of ideas, resources, information and experience among people associated with ELT and for the last one year you have been trying to enhance the professional communication among the members through this forum. This is indeed a big achievement and we need to continue this in the future. However, the readership network of this forum is still limited and we need to discuss how we can expand the readers’ network and make sure that they read and contribute to the discussion. C: How do you think we can increase engagement/contribution to networked discussions by NELTA members who have access? G: This is indeed a key concern for all of us and we need to work collectively on this issue. One of the strategies could be to use the quick communication channels such as facebook/twitters etc. to publicise about this forum and motivate people to read and contribute. For example, if someone posts a quick note on the facebook that s/he read the article posted in NELTA Choutari and make a very brief comment on this on the facebook and link the site on it so that people get motivated to read and contribute. Similarly, we can also put the notice in the NELTA newsletter and make announcement in the NELTA conference. Also, we could have a brief presentation on this in the forthcoming NELTA conference. We shall be happy to have a brief webinar on this if you would like to make a short presentation on this. C: Do you have any suggestions for conducting networked discussions in better ways so that branches and members can contribute better? G: Friends, this has been a great challenge for us and we need to find ways to engage the branch members in the professional discussion. I think we need to find a contact person in each branch who has internet/email access and work through that person. Some branch members have already started doing so on individual basis now we need to institutionalize this in all the branches. One of the strategies to promote this could be through the regional network that we plan to establish. Birgunj has already started the regional conference and Surkhet is holding the next. Similarly, we could have other branches from different regions to initiate this kind of activities and the lead branch that organizes the regional event could work as a satellite to disseminate this information. We have proposed this modality for the next English Language Fellow (ELF) when we submitted the proposal to the US embassy. (I have attached the proposal for your reference to give you detail picture of what this is about). These regional centers can be mobilized to promote communication among the branches. Perhaps we can start this on pilot basis. C: Do you have any practical suggestions for us to collaborate with NELTA in its efforts at increasing professional communication on and off line? a) Our members include teachers, trainers, researchers and various ELT practitioners. A large number of our members are also trainee teachers who at some point carry out research in various aspects of ELT. In order to support them with the resources, can we set up a site on NELTA Web page, or Yahoogroups or NELTA Choutari or maybe in all of them where we can hyperlink the academic research sites and also upload the articles from the US for our students so that they can have access to the materials? We can also include these materials in the discussion forums. b) We would like to put all the Master’s Thesis Titles and Ph.D. thesis titles on the NELTA web so that students can see what has been researched so far. It would be nice if you could also find the link from other universities where our students can see what kind of Master’s thesis are produced in other parts of the world. c) As I and Shyam talked on the phone, we could assign someone from NELTA to liaise the NELTA committee and groups like NELTA Choutari or individuals who contribute to NELTA on the Web. This will make the communication much easier and quicker. Finally, I once again thank the team that has managed NELTA Choutari very professionally and I also take this opportunity to say Happy New Year 2010. Yes, Mr. Sharma and the team deserve congratulations for the big initiation of professional communication President’s clear vision on it will definitely open up new avenues of penetrating it further into the professional community through upcoming events and clusters. I would like to welcome the webinar in Surkhet conference as well. I request Prem to arrange it for us all. Immensely down to earth your suggestions and proposals are. We are pretty convinced that these tips will help us carry on more resourcefully our undertaking of updating and professional networking in the days to come. Particularly, your personal conviction of deputing of an executive member for the coordination of a larger project NELTA on the Web including neltachoutari for further expansion and acceleration of ELT activities online is tremendously visionary. Further, endorsement of such an innovative scheme legitimately will create a sense of belongingness not only on the part of contributors but reciprocally thereby wiping out alienation so far felt. Likewise, although participating in online discussions via choutari, yahoo mail etc. should be voluntary and spontaneous, responses/comments from the (senior) NELTA colleagues will reinforce contributions, boost up the morale of the contributors and will also deepen the discussions which will ultimately lead us shape Nepalese ELT in our own way and build up our own theories. Of late, a wave of revolutionary change seems to be blowing in NELTA. A strong realization that has been amongst us is Nepalese ELT should not be directed by imported theories and principles, rather by the ones generated and contextualized in accordance with our own settings and needs. Therefore, time has come for NELTA to exert its efforts more on research oriented activities. Accommodating the Master’s and PhD’s titles on NELTA web as you have proposed will be a preliminary step towards becoming innovative. The department of English education owns a large number of researches which should have been applied by the concerned. Unfortunately, the theses seem to be rotting in shelves of the department. NELTA can work for the further applications of such research activities. Additionally, NELTA itself should also take initiative to promote research activities on its own. Web tools have brought groundbreaking changes in academia. Researches and experiences have revealed that technologies have power to boost up retention ability, develop intellectual skills, and build up problem solving ability and also to nurture creativity. In other words, technology provides new opportunities for enhancing students’ learning that otherwise would be impossible. Those who have embraced these tools have leaped forward and those who do not have lagged behind. Therefore, in order to survive and grow up in the networked academic world, NELTA need to develop more digitally. On the one hand, it has to embrace digital tools to expose its members to the vast treasure of research based materials available online. On the other hand, it has to venture to equip its members technologically so that they can make the most of those resources in order to enhance their professional expedition. NELTA therefore, today has to concentrate its attention and efforts on how digital divide in Nepalese ELT can be bridged. yes, it’s indeed a commendable work but it’s only limited on internet but those who do not have access to net are going to read the interview in my ‘only weekly of Terai The Young Guys published from Birgunj. If anyone has objection, pls do let me know. I am very happy to read the comments by Sajan and Uttam on the ideas that we have floated. I very strongly feel that NELTA should now be decentralised in its action. Rather than asking the colleagues at the branch level to organise activities as directed by the center, they need to be empowered to organise events and activities at the local level and share their rich experience in the wider forum. The center can facilitate this process by building capacity of the branch committee members and through exposure activities. We have already started this. Also, in this regard, NELTA Executive Committee has proposed the ELF’s working modality for 2010 on regional basis. The committee has also encouraged the branches to to organise regional conferences so that they can gain hands-on experiences in organising such mega events. This morning’s NELTA meeting (it was a full body meeting with the colleagues from the branches as well) at Little Angels’ School, Hattiban (the venue of the 15th conference) and we talked about how we can actively involve the branches in the discussion. I am happy to announce that the Committee has given Kamal Poudel the responsibility to coordinate e-communication both with the branches and the Choutari team. I believe that with the involvement of Kamal from the Central Committee and the ongoing professional commitment of Shyamji, Balji, Premji and Sajanji the network will gain a new height. Thank you very much and I look forward to reading your valuable comments and observation. Congratualtions to Dipendra who wil publish the interview in paper version. Perhaps regional centres could take account of this initiative as it is lack of communciation facilities, both mobile and computer, that is a problem for people in rural areas. This is an example of how regional centres can really enhance the spread of NELTA philosophy and include all opinions, teachers and students alike. On this last point, could I ask for clarification of what ‘Nepalese ELT’ is in practice. Sajan argues passionately that ‘Nepalese ELT should not be directed by imported theories and principles, rather by the ones generated and contextualized in accordance with our own settings and needs.’ Could I request the Chautari family to address what this means in practice. On a purely personal level, what I, and other foreign trainers, bring to Nepal is undeniably imported. Perhaps we can be helped to understand how, or if, we can contribute further? Questions are tools for thought and action. And this is a very important one. I could be wrongly reading between the lines of Kate’s comment above as suggesting that it is for the local Nepalese teachers/scholars to define the term, but since we are also talking about disrupting the local/global binary as a problematic construct, we can all contribute our own perspective on the issue of “Nepalese ELT.” I work as a business writing consultant, mostly with professors of marketing, management, economics, etc, and the disciplinary discourses and jargons freak me out on a regular basis, but I don’t stop offering my perspective as a reader of their text. I also study totally unfamiliar subjects like Queer Theory, but there too I role-play a learner who asks critical questions and challenges cultural assumptions, which many seem to appreciate. To be a cultural, disciplinary, or experiential other is a great privilege—-so long as it is appreciated by the “insiders” whom you may talk to—-and personally, I greatly, really greatly appreciate when Kate and Nelta’s many great supporters (or “well-wishers” as we put in Nepali English) challenge, inspire, and urge us to rethink—-actually, quite often, think about ELT! So, actually, what is Nepalese ELT? Or, what can it be? I am sure we need an answer, and I am also sure that we won’t answer it by regurgitating theories written by people in dissimilar contexts with dissimilar educational goals and material/social contexts. But I don’t have an answer myself: What is Nepalese ELT? One size does not fit all. Theories and principles that are practicable and effective in one circumstance may not be and have not been in many cases productive in another. The method that applies successfully in the US, may not apply well in Nepal owing to differences in the contexts. I have used the term contexts here to refer to socio-political, cultural, educational settings and also the aspirations behind teaching and learning of English. The past of ELT in Nepal reveals that we have ever taken ELT paradigms generated elsewhere for granted. That is to say we have adopted and tried to adapt blindly the global ELT practices, without taking into consideration the local realities. As a result, we have not been able to garner what we expected to pull off through teaching of English. Evidences show that people have learnt English for 10 or 15 years but have cut sorry figures on many occasions for not being able to communicate via it. This is the time we learn a lesson from the past and ponder over need and context based ELT. Think globally but act locally. I do not know if the reverse is possible and reasonable. If not, at least thinking locally is the need of the time. Unfortunately, the ELT of Nepal has ever been devoid of local realities. We have been carrying on and encouraging ELT discourse on NELTA choutari for knowledge building and constructing theories. We are and should be at one that Nepalese ELT professionals are worth capable of building theories upon their experiences and investigations. The theories constructed this way will fetch more than the ones that we have ever adopted from far-off. Nepalese English (Nenglish) is said to be in the process of standardization. If we consider English spoken here to be distinctive, Nepalese ELT should justifiably used for the English being taught and learnt in academic institutions of Nepal. However, this would merely be a winning justification. To provide a comprehensive picture, ELT professionals working for the promotion of ELT in Nepal and elsewhere should contemplate on it methodically. 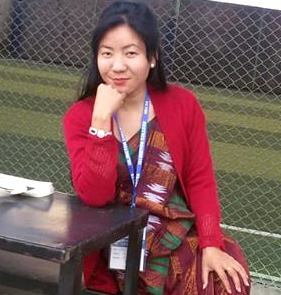 The people like you (Kate, Gretchen and others) who have dedicated the valuable parts of their life in the promotion of ELT in Nepal can in no way be called alien in ELT of Nepal. They understand well Nepalese socio-political and cultural contexts, Nepalese education system and ELT settings over here. I do not think what ELT professionals like Kate bring or do is Non-Nepalese. They have been very intensely associated with NELTA’s mission and have keenly worked with ELT professionals of Nepal. They understand Nepalese contexts fully and therefore, what they do over here can in no way be called imported. When I used the phrase imported principles and theories, I meant the assumptions and principles de-contextualised, de-nativised and the ones devoid of Nepalese needs and contexts. Bal Krishna in December Issue (in response to Birgunj Conference and Busting of Binaries) has already answered what it means when we use the word foreign or imported. He has said “It is not the color, race or nationality that makes a scholar or a teacher ‘foreign’ to a new context, it is the lack of knowledge that labels one as alien to the context”. As I said earlier, Kate and Gretchen (Sorry if I miss any other names) as far as I know have been the jewels of NELTA and Nepalese ELT. Therefore, their constructive suggestions and vigorous contribution in the promotion of Nepalese ELT can hardly be exaggerated. Their support in the days ahead can in no way be denied. Although I have made a tiny effort to shed light on what Kate asked for, my elucidations might not have sketched comprehensively what Nepalese ELT is and should be. Therefore, I urge colleagues for further contemplations on the phrase. Discourse reflects knowledge as well knowledge is constructed through discursive practices. Our discourses and dialogs, I see, are a form of constructing knowledge. Shyam and Sajan have already responded their personal as well as NeltaChoutari’s perspectives regarding what constitutes “Nepalese ELT”. I am not sure if the label ‘Nepalese ELT’ is appropriate construct to refer to English language teaching practice in Nepal or if it is a distinct pedagogic practice different from the rest of the world. We can discuss ‘if there is something called Nepalese ELT’ It is subject to further discussion. Thanks Kate for bringing this issue to a further discussion. The idea that I am trying to develop as member of the Chautari team is to contextualize ELT theories and methods that are fit the geopolitics of the particular pedagogic context. I do not mean to revitalize our ‘gurukul’ system of education where ‘guru’ knows all and ‘chela’ receives a pure form of knowledge from the authority unquestionably. (though there are bright sides of the gurukul education as well). The idea is to call for an ’emic’ perspective on teaching and learning of English in the Nepalese context. I must say that this idea is not new because we can find a huge literature on the topic. Suresh Canagarajah in the US, Adrian Holliday in the UK, Alaistari Pennycook in Australia, etc. have long been arguing for the idea. There is a bulk of literature that documents why task-based teaching failed in Hong Kong, why communicative language teaching was not successful in Korea and why learner autonomy could not yield fruitful results in Japan. The context of Nepal is also different due to its political, social and historical reasons. The following blog entry by Laxman Gnawali http://www.teachingenglish.org.uk/blogs/laxmangnawali/teachers-social-change-agents gives one example of how teaching leaning process and teachers in Nepal are viewed as, which of course is not generalizable to all the contexts in Nepal (which the author probably does not intend to do). Nepalese ELT practices as we all know has been undertheorized and less-decumented, and has not been much reported and represented in both local and international scholarship. Choutari is trying to address this crucial issue making a call for local research. Another issue that I always look at critically is also the studies that we in Nepal have done so far. Most studies that have been carried out in our formal university settings, for example, come up findings that conform with the similar ones that have been reported in Western countries; issues like students working in groups and pairs do better than working alone, cooperative learning is better than ABC learning, learner autonomy yielded better results, etc. etc. We need to critically look at those constructs and fairly report if these theories and constructs developed and used in other socio-political contexts yield the same results in Nepal. Nepalese scholars need to develop this perspective. Let me point out another issue. Knowledge and skills gained through several exposure trainings and education programs in different contexts in the world are always subject to a critical look in the Nepalese context before we easily ‘pick up’ and use them as they are. I have seen postings on Neltamail, for example, reporting that “I attended XYZ program for 6 months in ABC country, I learned MNO and used that in my class. Then my students achieved the same thing as the students of ABC countries.” I doubt such superficial statements. We should be able to say “I learned this and used in my class. It was successful but I had these challenges or it was not applicable due to the following reasons” or something like that. Third issue which might address Kate’s question to Choutari family is: what is local ELT method, and what is imported, and what is Nepalese ELT, etc. From a personal level, I never mean to develop an ELT method in Nepal from a scratch. There is probably nothing like Nepalese ELT method, Indian ELT method, or something like that. In today’s world where we are interconnected via global media of communication, nothing is ‘purely’ local. The idea that Choutari is advocating might sound counter-favorable to the foreign scholars who have been working for NELTA in Nepal. We never mean that. ‘Need analysis’ before delevering a teacher training program, for example, is a solid example of what it means to be emic and contextualized practice of English pedagogy. Finally, (this might sound too repetitive), we need to ‘appropriate’, ‘adapt’ and adjust the so-called theories and methods of ELT according to our local context, rather than to pick them up and use them as they are in far-away lands. I admit that this is the beginning of our professional discussion, and should continue further to explain ‘what it means to use a local ELT method’ or ‘what it means to ‘contextualize the global ELT methods to local contexts’. One of the things that Kate and I have been sharing regarding the local realities and global ELT is that we can use the conference time to collect the training needs of the teachers. Since Sajan, Prem, Kate and I will be here in the conference, how about we develop a brief questionnaire and distribute it to the conference participants? Then we collect it and see what training needs are suggested by the participants. This will be very useful for us to design the training sessions when we travel to different branches. We could do this both in Kathmandu and Surkhet conference and collect the training needs of teachers teaching in diverse locations. This is Kate’s idea and I think that this is a brilliant idea. What do you think friends? I’m wondering if considering ‘goals’ and ‘outcomes’ would be useful. Bal talks of many initiatives elsewhere that haven’t worked, and Sajan quite rightly says there is no ‘one size fits all’. Do we know why initiatives don’t work, do we know what they were designed to achieve? If there were any goals, were they well thought through and achievable? What is appropriate for Kathmandu with its resources, both material and knowledge based, will be out of reach of most rural areas. I think each of us involved in Nepalese ELT are coming from different perspectives looking for different solutions for different problems. So yes, Sajan, I think we do have to start from local. But even then, we cannot expect a rural teacher to tell us what they want if they do not know what is either possible or available. They deserve to be made aware of what is happening elsewhere, goals need to be developed but not before the means of attaining the goals are explored. Centralisation of expectations means that thousands of children are failed because of a system that is serving neither the teachers nor the students. This is not just a criticism of ELT but literacy levels in Nepali I believe are only around 50%. So what are we trying to achieve? Isn’t it interesting that neither top-down nor bottom-up theories on their own have the answers. We must strive to see through many pairs of eyes. Excellent ideas. Ganga sir and Kate, the first step will be to start working on need analysis of the teachers, and come up with a proposal/plan of action with achievable goals. This is the idea Kate is advocating for some time now. I agree with Kate that teachers do not always know what they want and what they need to know. But at least we can have a lot of input on the basis of which we can fine tune our program. Yes, owing to the socio-political situation of the country, we have a lot of challenges for pedagogy. Let’s work on that. We talked about the survey in the NELTA committee meeting yesterday and everybody is very happy to hear this good news. Once we have the needs from this Survey, we can plan series of training in the NELTA branches. In order to get this going, the committee has formed a new team to work on the plan to use the NELTA human resources for various activities including training. The team will prepare a roaster of all the NELTA members who have attended various professional development opportunities (home and abroad) through NELTA and then work on a plan how their expertise can be best utilized for the benefit of other teachers. The team members are Laxman Gnawali, Gita Sitaula, Lekh Nath Baral, Kashi Raj Pandey and Siddhartha Dhungana. They will submit their report in two week time. It certainly is a good news, Ganga Sir. As far as I know, the members in the team are trained, experienced, and committed to bring changes. I will always be here as a human resource to help in a possible way, as well as person to provide with published academic resources when need be.